Ebony H. Griffin is a staff attorney with the Public Interest Law Center focusing on Environmental and Food Justice. Ebony focuses on projects that support low-income, historically disinvested communities and communities of color in advocating effectively for sustainable and equitable neighborhoods. She is also the Director of the Garden Justice Legal Initiative, a project providing pro bono legal support, policy research and advocacy, and community education and organizing to community gardeners and market farmers in the Philadelphia region. Ebony has extensive experience in the field of environmental law. In law school, she worked as a summer law clerk for the White House Council on Environmental Quality and also spent five months clerking for the Office of Enforcement and Compliance Assurance at the Environmental Protection Agency. After law school, Ebony clerked for the Honorable Judge Zoe Bush of the Superior Court of the District of Columbia for one year. 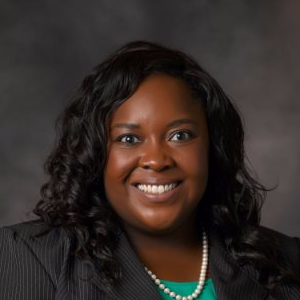 After clerking for Judge Bush, Ebony spent several years working as an environmental and safety regulatory associate at Enhesa Inc. in Washington DC. Ebony is a graduate of Howard University School of Law where she was an editor on the Howard Law Journal. She received her Bachelor of the Arts degree in Spanish from the University of Alabama at Birmingham. Her professional memberships include the Philadelphia Bar Association, National Bar Association, and Alpha Kappa Alpha Sorority, Incorporated.